Hello, dear players. Let’s talk about Shaman add-ons which will help you to play World of Warcraft not only on official server, but also on free-to-play uwow.biz project. 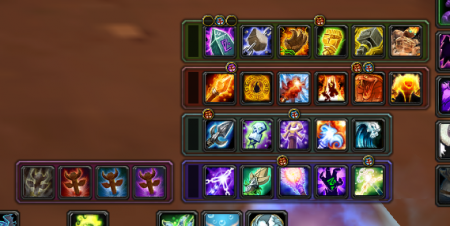 This add-on helps you to maximize your DPS as “Elemental” Shaman. It shows the optimal rotation and prompts you what ability it’s better to use at a certain moment. This modification is able to adapt to a particular situation. It can be useful in PvP, however you should use it for PvE aspect of the game. Elementarist can also help you to master your Shaman skills. Bitten’s SpellFlash: Shaman is a SpellFlash module. It highlights Shaman abilities, which are better to use at a certain moment. You can achieve maximum DPS by doing the right rotation and your high damage will help your raid or group greatly. This add-on suits “Elemental” specialization more. There can be some problems with rotation display in “Restoration” and “Enhancement” specializations. It divides the totems into nature groups. It’s very convenient in combat. 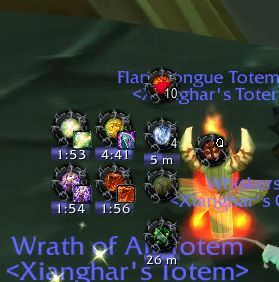 You can put and remove the totems quite fast. You no longer need to waste your time searching for them on the bars. Every bar has its visual cooldown, which allows you to track recharging totems. Its unique feature is that it can memorize your sequence of actions, which then can turn into macros. This add-on can also repeat your actions if needed. This modification helps you to keep the right rotation going. Hedd is based on DPS aspect. It focuses on BiS items, but it can also be customized for lower item level gear. After its installation, you will get the “TT Cast” macro. By using it you can put totems of different elements. In order to choose what totems to place, go to the settings and select the totem you need by pressing right mouse button. It’s a small, but very useful add-on for every Shaman. It reminds you about your shields, some buffs and other less important stuff. 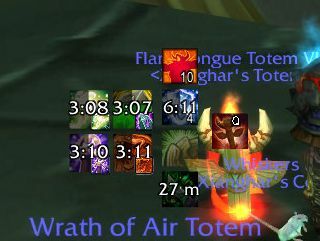 This is another useful add-on for Shamans, which will prompt you the right rotation. It’s useful in away that it tells what ability you should use in order to maximize your DPS. It’s a small, but an extremely useful add-on. ShieldsUp suits any Shaman specialization. It reminds you about the shields, which were on the character. PetTimeToLive is developed to track the duration of your temporary pets. For example, spirit wolves and elementals. This modification is for “Elemental” and “Enhancement” specializations. It shows the cooldowns of all shock abilities, shield charges and so on. In addition, it also prompts you the right rotation. This add-on will help new players to master Shaman gameplay. Perhaps, these are the main modifications, which will make your Shaman experience more convenient and pleasant. Of course, there are also other add-ons, which have functional similarities with these that are listed above. You can find and try them out.